At the Center for the Future of Teaching & Learning, we believe the key to unlocking student success is by growing teachers’ skill, knowledge, and voice; creating the conditions for them to thrive; and amplifying their great work. Our researchers have years of experience conducting timely and methodologically rigorous research studies, including qualitative and quantitative analyses, surveys, focus groups, case studies, and systematic reviews and meta-analyses of existing studies. In addition, the center has experience leading networks and serving as the fiscal intermediary on behalf of philanthropic foundations, overseeing all aspects of grant management — from funding to administration to evaluation and reporting of individual and collective impact of the grantees. 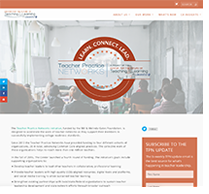 The Teacher Practice Networks initiative, funded by the Bill & Melinda Gates Foundation, is designed to accelerate the work of teacher networks as they engage their teachers in successfully implementing college-readiness standards. 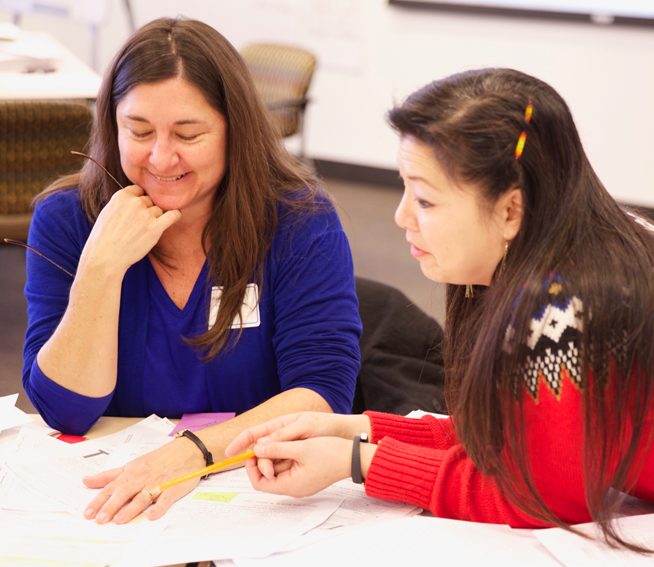 Since 2013, the center has acted as an intermediary, supporting nearly 40 organizations that are leading these teacher networks. The collective work of these networks helps to reach more than one million teachers. 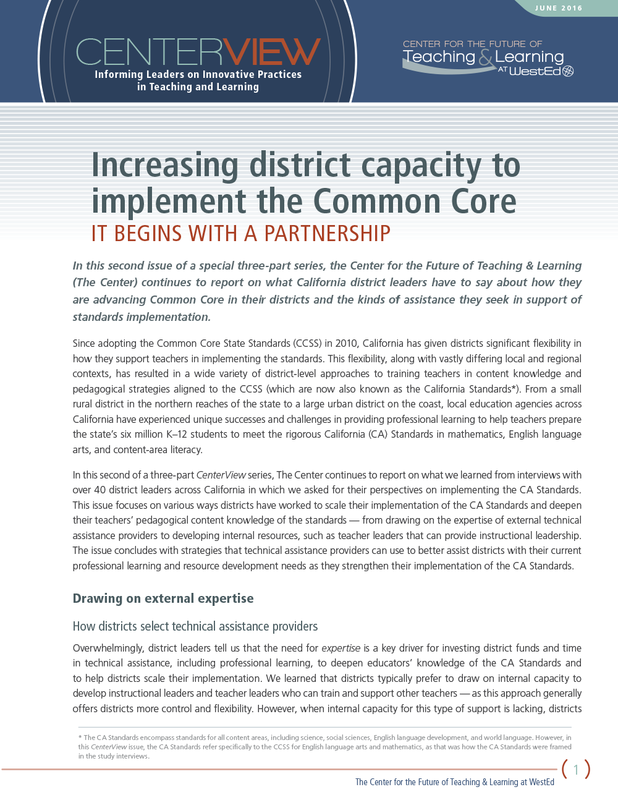 The Center for the Future of Teaching & Learning, in collaboration with the Bill & Melinda Gates Foundation, launched the California Initiatives in response to the immense challenge facing the state’s educators: successfully implementing the new California State Standards to improve student success. The center believes that leaders of schools, districts, and support providers can work together to ensure equitable outcomes for our students and their teachers. The California State Standards raise the expectations for our students, so we can set new standards for how we work to ensure students meet those expectations. Be sure to visit https://thecenter.wested.org/ to learn more about our work and latest developments. 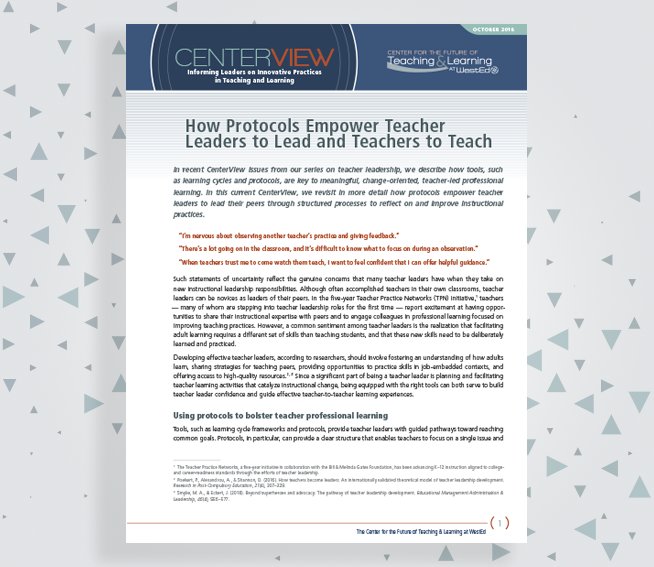 Learn how three protocols can help empower teacher leaders to lead their peers through structured processes and improve instructional practices. At every school there are expert teachers with the capacity to lead. 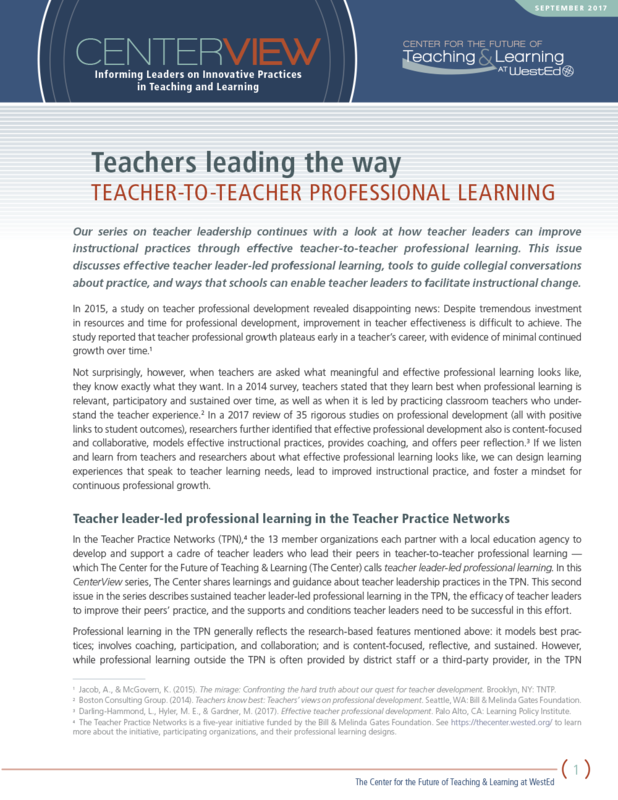 Learn how Teacher Practice Networks is capitalizing on that expertise to promote powerful teacher-to-teacher professional learning. 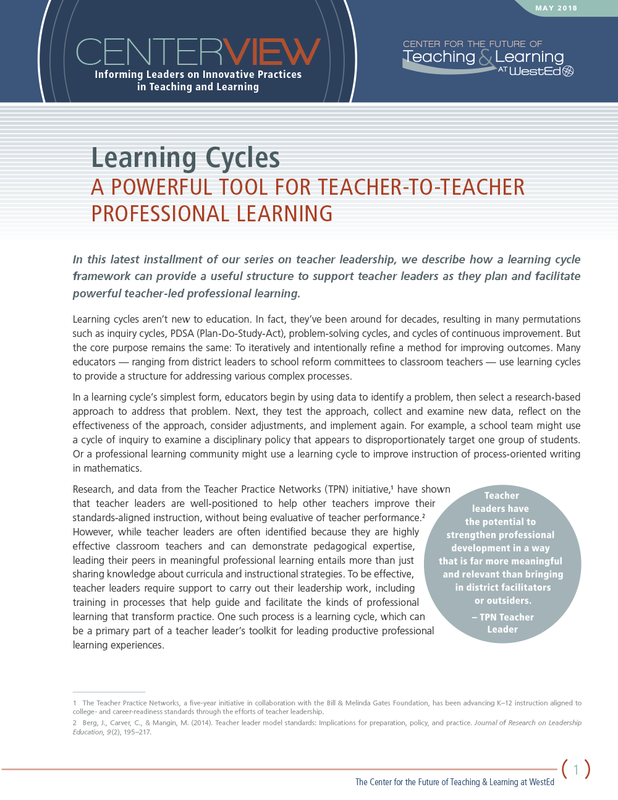 Use a learning cycle framework as an effective professional learning strategy. Teacher leadership can foster professional growth, improve instructional practices, and enhance school culture. 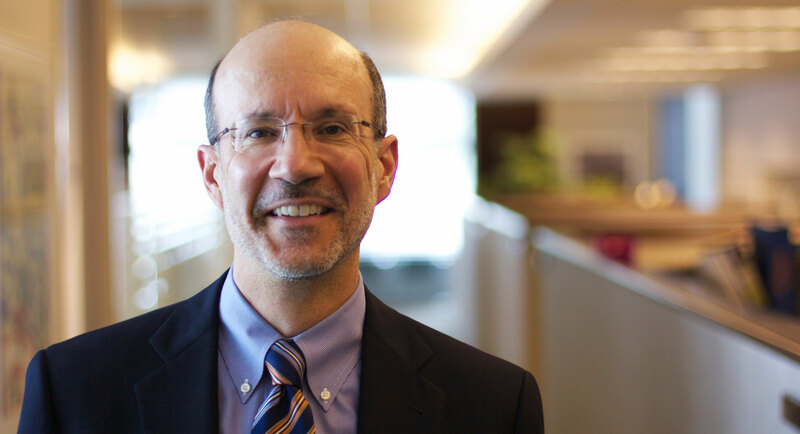 WestEd’s Robert Linquanti will deliver a keynote address. 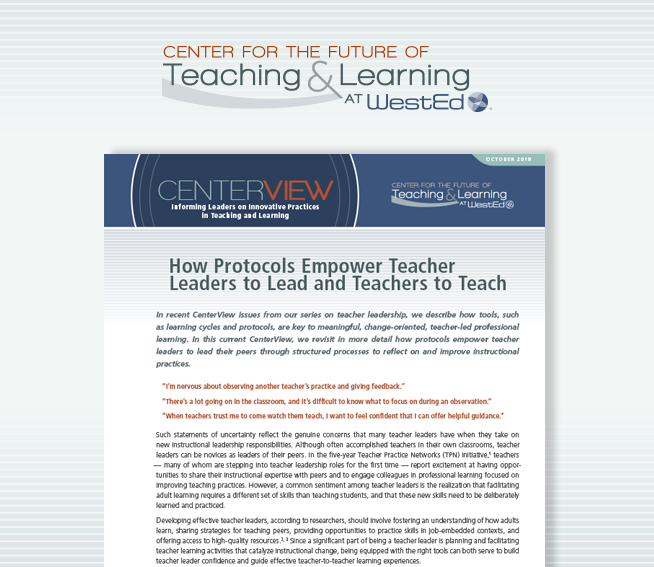 This CenterView describes three protocols designed to help teachers communicate in a focused way that can often lead to change in practice. 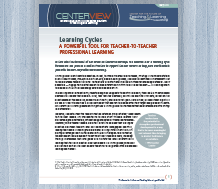 Discover how a learning cycle framework provides structure to teacher-to-teacher professional learning. 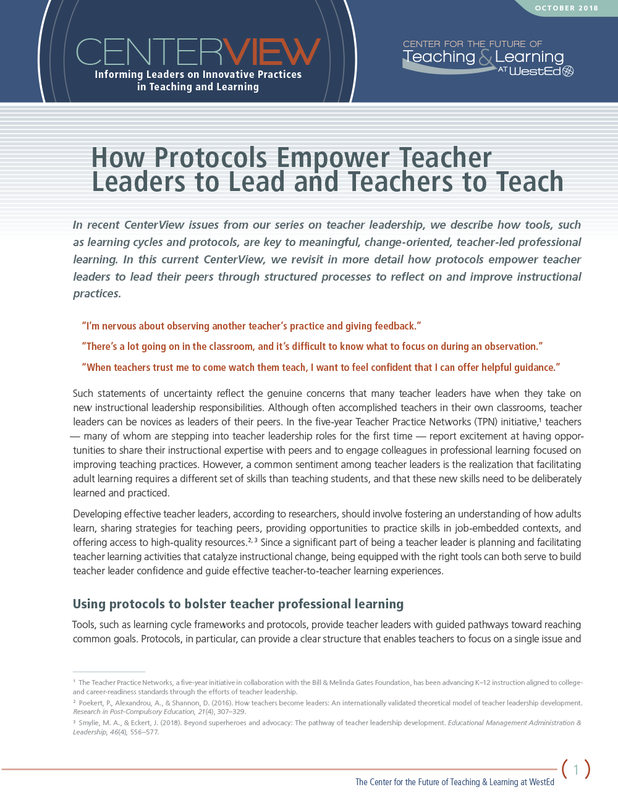 Learn how teacher leaders are enacting teacher leader-led professional learning and what school administrators can do to support and sustain this approach. 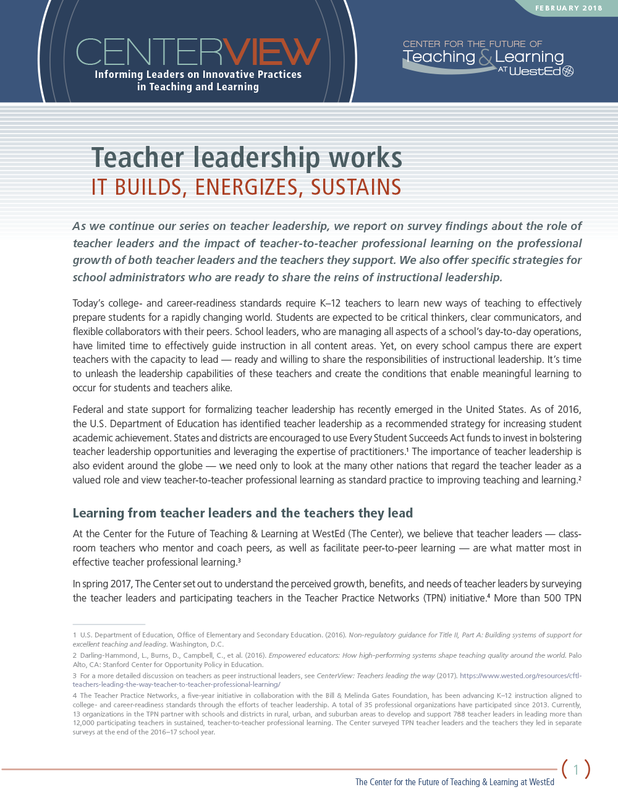 Learn how school districts can enable successful teacher leadership to improve standards-aligned instructional practices. 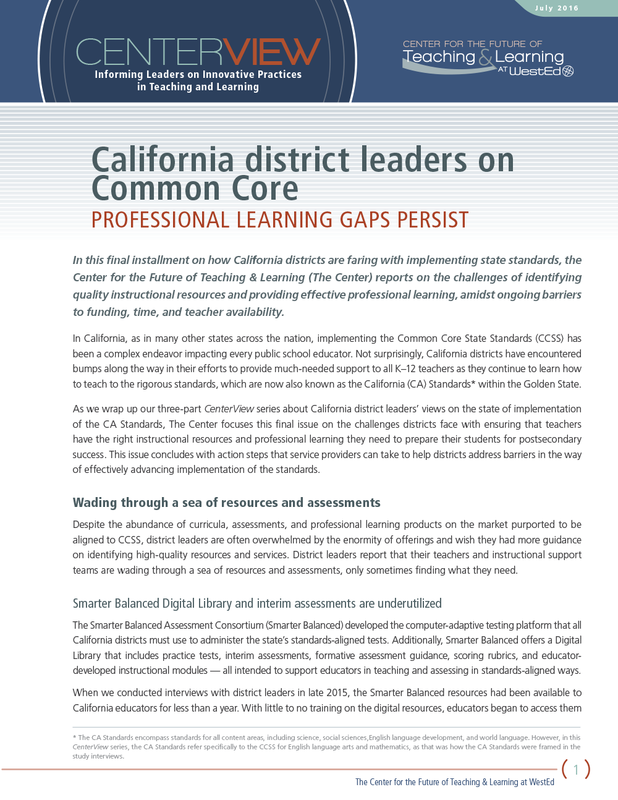 Learn what challenges California school districts experience in accessing the instructional resources and professional learning opportunities their educators' need. 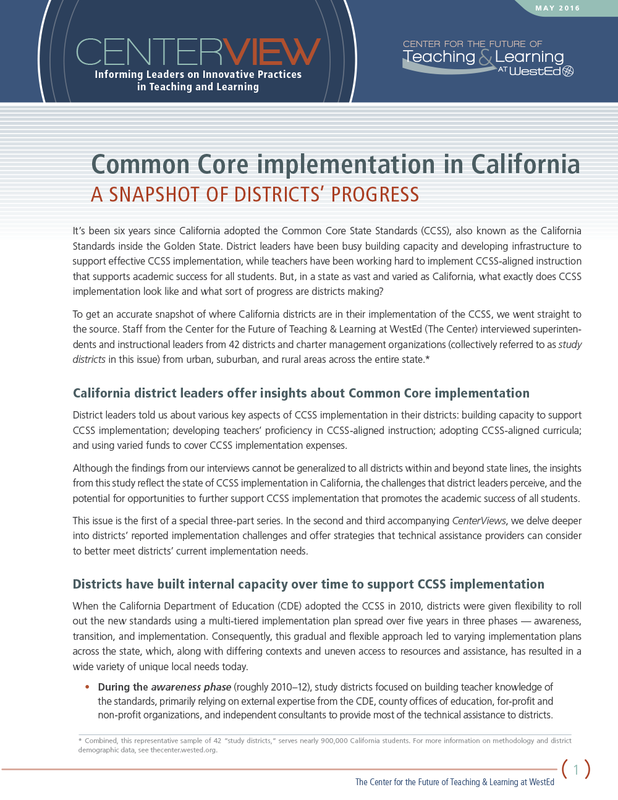 Read about California district leaders' perspectives on Common Core State Standards implementation and the technical assistance districts need. 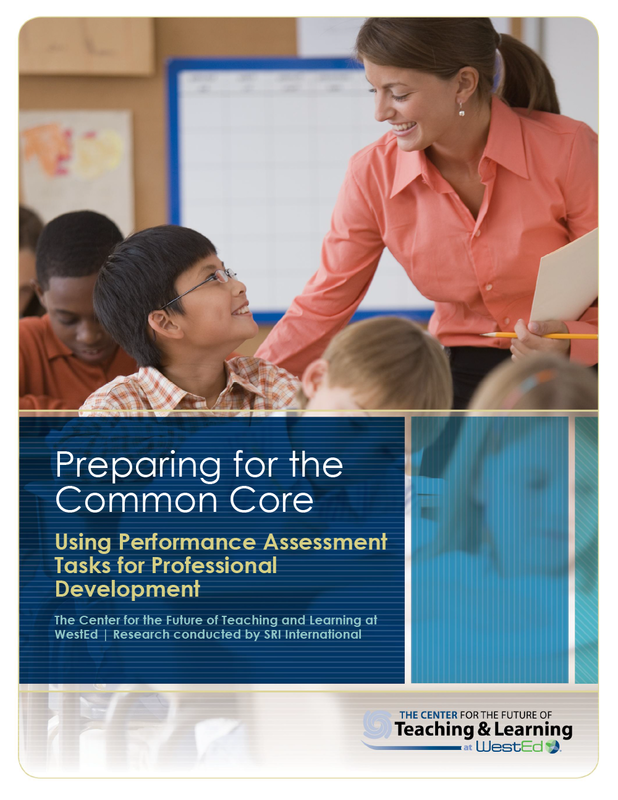 Learn how the new standards are being implemented in California. 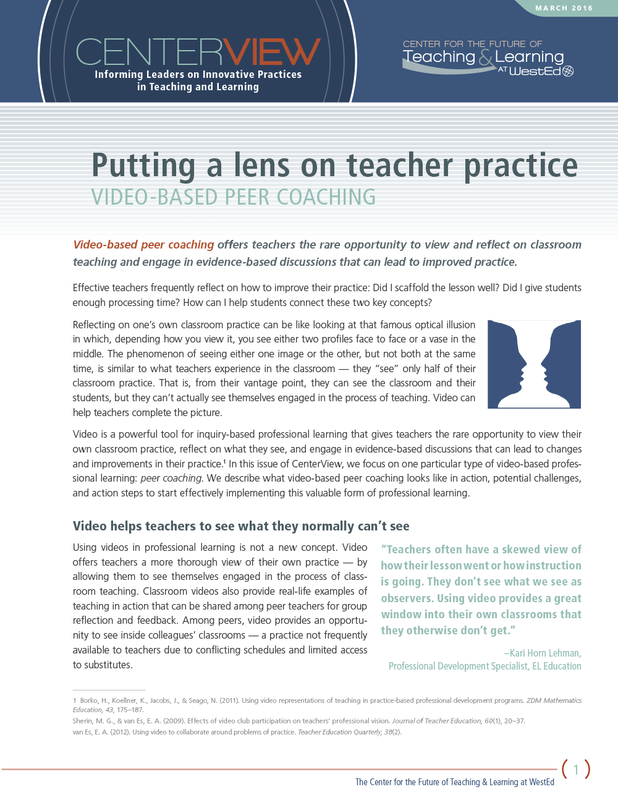 Learn how video-based peer coaching can be a powerful tool for improving classroom instruction. 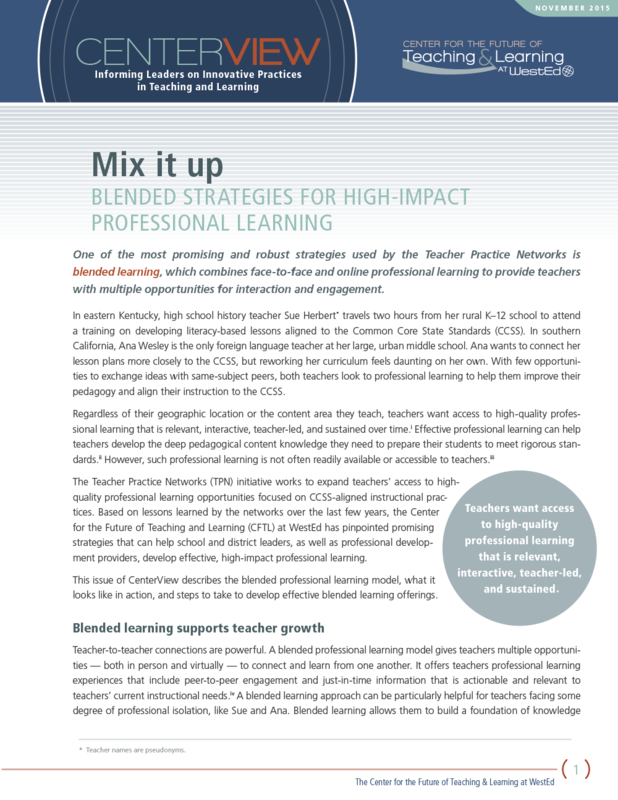 This CenterView issue describes what blended professional learning looks like in action and recommends strategies for maximizing teacher engagement and buy-in. Find out how after-school programs are building partnerships and focusing on science, technology, engineering, and mathematics (STEM) education. 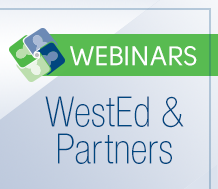 This archived webinar focuses on preparing current teachers or those affected by layoffs with the content knowledge required to teach science in grades K–8. This 13th annual report on the California teacher workforce takes an extended look at principals in our Golden State and their vital role in supporting teacher effectiveness. This 13th annual report on the California teacher workforce takes an extended look at principals in the Golden State and their vital role in supporting teacher effectiveness. 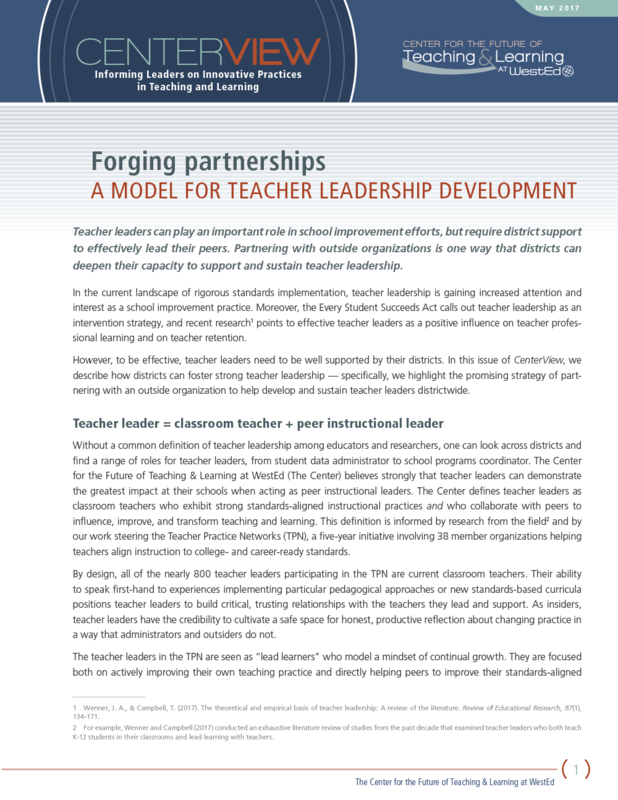 Based on the forum's deliberations, as well as a review of the literature and other data, this policy brief explains ways principals can promote learning and support teachers. This issue of CenterView, produced by the Center for the Future of Teaching and Learning at WestEd, offers suggestions to strengthen science education in California. This report, produced by the Center for the Future of Teaching and Learning at WestEd, illustrates the impact of budget cuts and policy shifts on California's teaching workforce. CenterView: Who Will be Left to Teach? This issue of CenterView, produced by the Center for the Future of Teaching and Learning at WestEd, addresses the critical issues of equity and teaching quality. Creating a Well-Prepared Science, Technology, Engineering and Mathematics (STEM) Workforce: How Do We Get from Here to There? 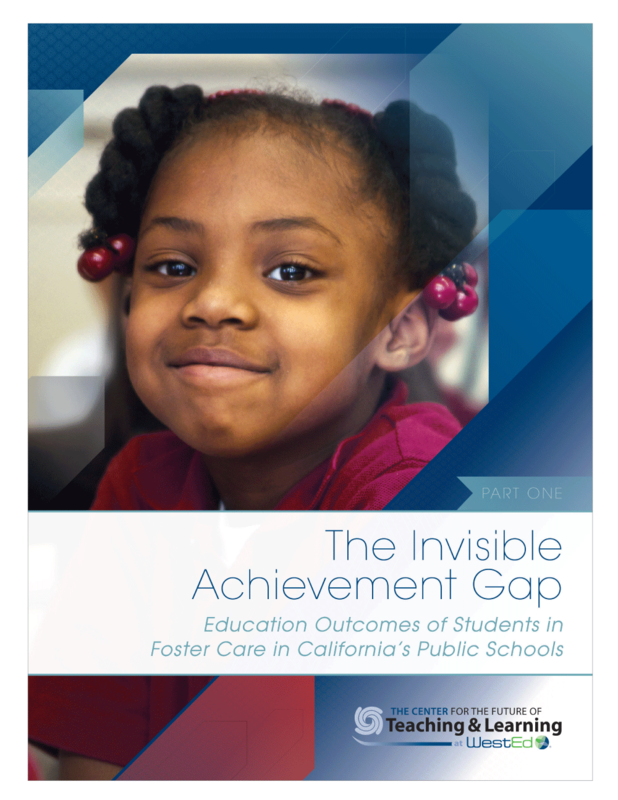 This report explores how California can strengthen science, technology, engineering, and mathematics achievement. 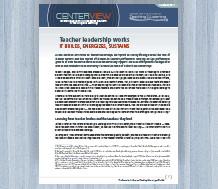 This policy brief, produced by the Center for the Future of Teaching and Learning at WestEd, is part of a broader effort to bring the central role of principals to the forefront. This issue of CenterView provides an update on the 2005 CenterView focusing on 8th-grade Algebra I and finds that, unfortunately, not much has changed. 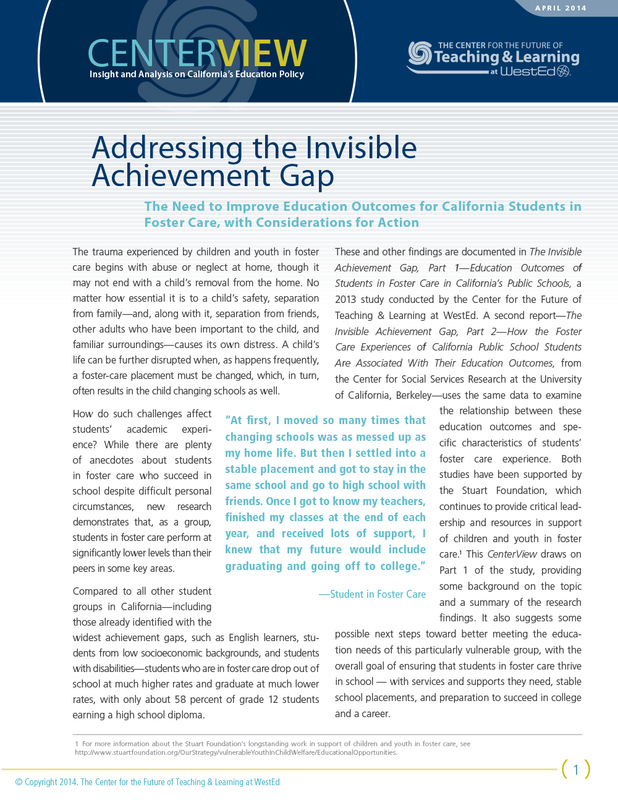 This issue of CenterView highlights research that shows the achievement gap experienced by foster youth leads to fewer economic opportunities and more adverse outcomes. This issue of CenterView, developed by the Center for the Future of Teaching and Learning at WestEd, focuses on policymakers' and administrators' need for reliable and current data. CenterView: Why Do Teachers Leave? This issue of CenterView reviews research on why teachers leave the profession and what might prompt them to stay or return to the classroom. 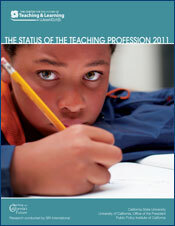 This report provides data on the mathematics and science teaching workforce in California. CenterView: Where Have All The Teachers Gone? 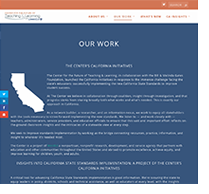 CenterView: No Child Left Behind and the Federal Mandate That All California Teachers Be "Highly Qualified"
This summary report, produced by the Center for the Future of Teaching and Learning at WestEd, reviews research that examines and analyzes California's teaching profession. This paper argues that an effective teacher is one who learns from teaching rather than one who has finished learning how to teach.